In aid of Breast Cancer Care, we invite you to join us for a Christmas party night full of music, magic, and traditional Scottish food. 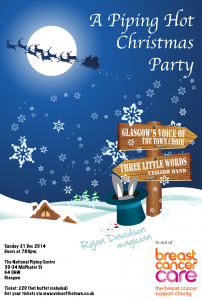 With performances by Glasgow’s Voice of the Town, one of the top Ceilidh bands in the country, Three Little Words, and some jaw dropping tricks by magician Ryan Davidson, it promises to be a fantastically fun and festive evening. And if that weren’t enough, you will enjoy a delicious hot fork buffet and a great set of DJ party tunes to see out the night – so bring your dancing shoes! Remember, this event is in aid of Breast Cancer Care which means that by attending this event, not only will you have an unforgettable evening, but will be helping thousands of women in their fight against cancer. One in eight women will get breast cancer. Its devastating effects touch thousands of us every day. And for those women already facing their own breast cancer journey, its brutal effects are a daily reality. Breast Cancer Care’s specialist nurses, local services and emotional support network mean there’s always someone to turn to for information and support. Every year the charity helps thousands of women find a way to live with, through and beyond breast cancer. So come support us as we support them. Thank you.